Whether used for transport, adventure, work, or sport, boats have played a vital role in human history and have inspired numerous stories. 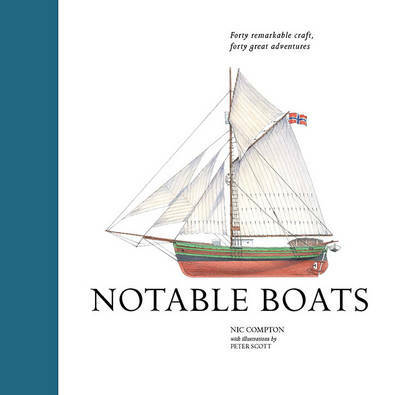 The 40 boats featured in Notable Boats will gently float you away with tales of bravery, adventure, and the odd moment of near catastrophe. The book skillfully balances intricate and beautiful visuals, attractively styled statistics, and gripping text. As well as everyday crafts such as the canoe and the fishing trawler, there are boats of historic interest, fictional ships, and even celebrities' boats. Each boat will be featured across two spreads, including the aerial view of its deck/interior plan, a color study, and a description of the boat and what it is famous for. The stories cover the globe, with adventurous tales from all the world's waterways. Designed to be dipped in and out of, Notable Boats offers an intimate window into a world of sailing for those whose passion it is-and those whose passion it isn't-alike.